Inventory We are a resale marketplace, not a box office or venue. Ticket prices may exceed face value. This site is not owned by Tennessee Performing Arts Center . 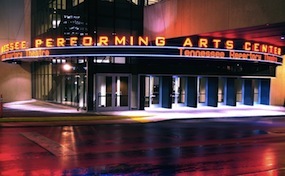 The Tennessee Performing Arts Center is Nashville's premier theatre for all the most popular traveling Broadway Shows. TPAC Nashville tickets have included smash musical hits like the Lion King, Wicked, Les Miserables, Jersey Boys, and The West Side Story. TPAC.TheatreNashville.com is an independently owned and operated company that specializes in the online retail of tickets in the secondary market. Our entire inventory may be above or below face value. We are not affiliated with any official website, box office, or supplier. To order any Tennessee Performing Arts Center Nashville events simply follow the easy to navigate steps online or call our operators at anytime.